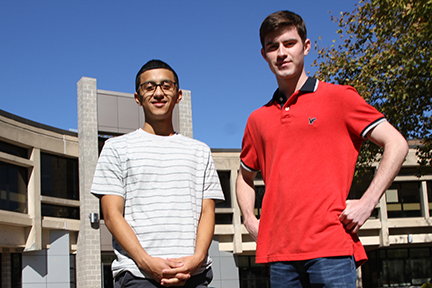 Mercer County Community College students Jason Lima and Dan Hurley, recipients of the 2016 Coca-Cola Leaders of Promise Scholarship. WEST WINDSOR – Two Mercer County Community College (MCCC) students have been honored as part of an elite group nationwide as recipients of the 2016 Coca-Cola Leaders of Promise Scholarship. The scholarships are awarded to members of the Phi Theta Kappa (PTK) Honor Society at two-year colleges. The Coca-Cola Scholars Foundation awarded $1,000 scholarships to 200 students out of more than 1,100 applicants. Hamilton resident Jason Lima, a Nottingham High School grad, and Daniel Hurley of Plainsboro, a graduate of West Windsor-Plainsboro North, were among those selected. Both will be graduating from MCCC in May 2017 and plan to transfer to a four-year college to pursue bachelor’s degrees. Both students are enrolled in the American Honors at Mercer program. Hurley, a Liberal Arts major, plans on studying Political Science when he enrolls in a four-year degree program next fall. Lima is majoring in Business Administration. Lima is an active member of PTK, and is the vice president of MCCC’s Global Business Club. He praises his Mercer education, and believes it has given him the edge to compete on a bigger stage. Likewise, Hurley has assumed a number of leadership roles during his time at Mercer. Last year he helped establish the MCCC Democrats Club – the first club of its kind at a community college in New Jersey – and currently serves as president. He said he wants to work to encourage college students to be more politically active, and that a diverse college community and an engaged and accessible faculty at Mercer enhances his college experience. MCCC President Dr. Jianping Wang congratulated the two students for their initiative in taking advantage of everything the college has to offer.